Dozens marched through the Bronx and Harlem to commemorate the life of Alex Nieto, two years after he was killed by San Francisco police. Dozens of protesters marched through the Bronx and Harlem on March 21 to commemorate the life of Alex Nieto, two years from the day he was killed by San Francisco police. Nieto was 28 years old when he was gunned down in 2014. He was eating a burrito in Bernal Hill park before police arrived in order to respond to calls they received about a Latino man with a gun. Nieto, who worked as a security guard at a local nightclub, was dressed in a red San Francisco 49ers jacket and had a taser he had been issued for his job in a holster under his coat. Although Nieto was a San Francisco native, the white men who called the cops on him were newcomers to the gentrifying neighborhood and described Nieto as a “probably foreign” man with a handgun. Shortly after arriving on the scene, police shot 59 bullets at Nieto, hitting him at least 14 times. The cops claim that Nieto had pointed his taser at them. Earlier this month, on March 10, a federal jury sided with the cops involved in Nieto’s death and ruled that they did not use excessive force. Nieto’s death soon sparked protests as well as debates about gentrification and its connection to how the police treat people of color in gentrifying neighborhoods. In order to pay tribute to Nieto, New York City activist group NYC Shut It Down decided to dedicate one of their weekly #PeoplesMonday protests against police brutality to Nieto. They were joined by another group, ICE Free NYC, who helped organize the action, which focused on a theme of black and brown unity. Protesters gathered at Brook Park in the Bronx at around 6 p.m. and enjoyed songs and poetry about Nieto, a bilingual Know Your Rights training, and a ceremonial performance by Cetiliztli Nauhcampa. Burritos were also served in remembrance of Nieto’s last meal. 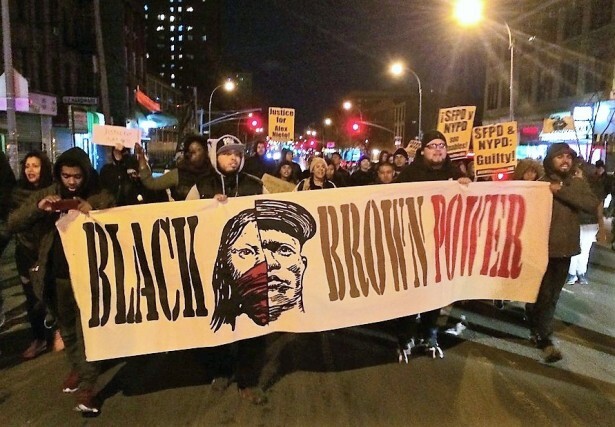 After the rally in Brook Park, protesters began marching and quickly took the streets of the Bronx led by a banner that read “Black & Brown Power.” The marchers soon shut down traffic on the Willis Avenue Bridge, which connects the Bronx and Harlem, as a number of motorists honked their car horns in support. The marchers then made their way to 125th Street in Harlem, shutting down traffic as they marched down the street. Multiple police vehicles showed up and began trailing the marchers. Police ordered them to disperse and get off the street, but those orders went unheeded. The protesters made it all the way to 116th Street without any arrests and ended the march. Ultimately, the protesters said they hope to make Nieto a symbol of the oppression faced by black and brown people in this country and to use this tragedy to connect movements on both sides of the United States in the struggle to end this oppression. No matter what happened, all white people are to blame, simply because they’re white. These non-working losers are to blame for what’s wrong with America. Barry, You are what’s wrong with America. We are tired of your ignorance and hate towards us, and we are no longer going just sit around and let it happen anymore. That is why you, and other bad people like you are so upset. For us, that’s good news. If you’re out to stop us from getting the same American dream as you, then we’re going to make it so painful for you that you end up giving up. The real reverse racism that you claim time and again, is just us trying to stop, YOUR racism. The other Barry… It’s amazing that you conjured up that response to Barry’s post. What happened to Dr. Martin Luther King’s dream? It’s a shame today’s black people don’t live that dream. Violence is not the answer. Time to stop the hate and hate groups. Why aren’t they protesting the death of blacks by blacks? Why do they confront police in a menacing manner? People die at the hands of police by their confrontation and not following orders.